Author Ron Verzuh’s robust website houses hundreds of his writings in a wide variety of categories. He posts new articles and images through a blog. 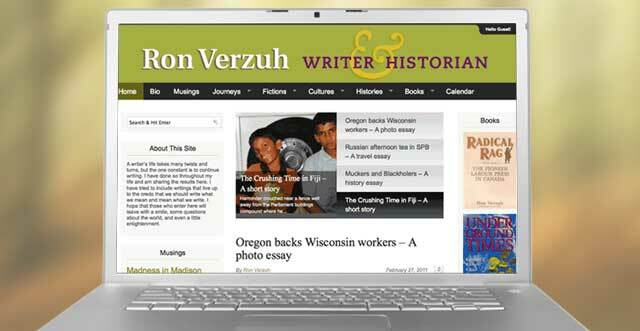 The website we created for author and historian Ron Verzuh is based on the Magazine Premium WordPress theme. By using an existing web template as a base and adding custom touches, we were able to save a lot of programming time while still presenting the client with a sophisticated and well functioning site. Verzuh — a PhD student of history, and a former national communications director for the Canadian Union of Public Employees — uses the website to showcase his extensive collection of writing which includes books, numerous papers, magazine articles and columns on a wide range of subjects. In addition, he is presenting podcasts and video productions. Prior to launching this site, he already had a WordPress website and was comfortable maintaining it. Houses a diversity of writings including several blogs, articles, travel journals, and works in progress. Provides a platform from which to market several of his books. Incorporates his travel photography, video productions, and a podcast which he produces for Radio Labour. Primarily a labour historian, Ron writes for the labour movement from a historical point of view, and with a global scope. By making all of his writings accessible on the internet, Ron aims for a broad audience of young readers who are keenly interested in labour issues all over the world. WordPress: WordPress is web software you can use to create a beautiful website or blog. We like to say that WordPress is both free and priceless at the same time. Magazine Premium WordPress theme: MP is the most advanced theme ever developed by Themes by bavotasan.com with an extensive list of useful features. We used samples of Ron’s work and a rough sitemap he provided to create a prototype site. Ron evaluated the system and approved the approach very early on in the process. After asking numerous questions, we got the go-ahead to begin the full build-out of the site and to begin theme customization. One of the reasons we chose the Magazine Premium theme was the ease with which we could change its appearance. 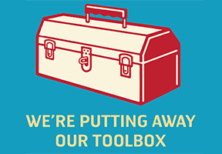 We were easily able to apply Ron’s visual identity to the site as well as precisely rearrange the front-page layout. Then we imported all of Ron’s content from his existing site into WordPress using the WordPress import tool. At this stage Ron organized all of his articles into the new categories he had developed. After working with the completed site, Ron identified several necessary changes which were implemented easily with the Magazine Premium theme.